So I updated to the new version of Silhouette Studio which includes the Silhouette Cloud...and guess what it didn't take all day (just 20-30 minutes actually), it didn't cause me any more gray hairs, and it still have ALL my files! While the new release of the Silhouette Cloud in the latest version of Silhouette Studio is getting a lot of talk, it's nothing to be too scared of especially now that Silhouette America has released more information. Initially Silhouette America quietly released the Cloud without any instruction or information other than a 5 word statement which basically stated the Cloud feature was now included in the latest version of Silhouette Studio Version 3.7 With just that limited information I recommended Silhouette users wait until more information was released. Fortunately, Silhouette America has done just that - releasing a rather lengthy FAQ to help users understand. And because of that I became more comfortable and decided...to go ahead and upgrade to get Silhouette Cloud. I still completely understand that some users are going to want to wait it out because there will be bugs that need to be fixed, as with any new technology. But I know some of you are anxious to try this new upgrade and since I'm now comfortable with it - I've gone ahead and upgraded and I'm here to tell you exactly how to do it, too. 1) Open up Silhouette Studio and BACK UP YOUR LIBRARY!!! 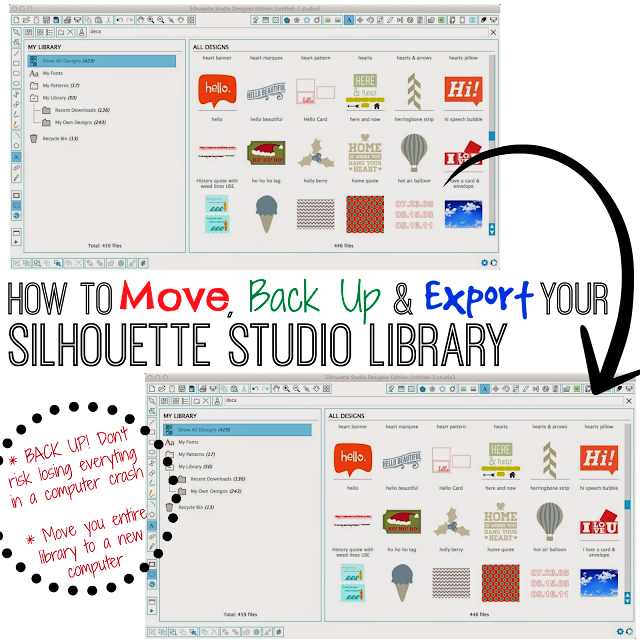 If you're not sure how to backup your library read this detailed post on how to export, copy and backup your Silhouette Studio library. Save the backup to your computer's hard drive. Don't save it to another cloud or a thumb drive. 2) Go to Silhouette America and download the new version of Silhouette Studio for either MAC or PC depending what you own. 3) Once you download, you need to install, so find the file: silhouette-studio_v3.7.206.dmg on your computer. Click it to initiate the installation. Note: When prompted if you want to save as a new version or replace the old, I would suggest picking "Save both." 4) Follow the onscreen prompts. On my MAC I had to pull the Silhouette logo into the Applications Folder. Then I needed to go to the Applications folder and launch the program by clicking on the Silhouette Studio Logo. The screen grabs and windows may appear slightly different if you're on a PC. 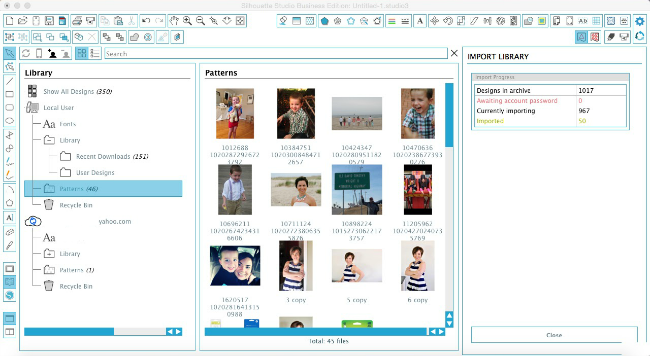 5) Once the updated version of Silhouette Studio opens, you may get a window that looks like this. For me, the sync never started when I clicked "Update Library" so I 'aborted" it. If this happens to you, open Silhouette Studio. 6) Once you open Studio, you will once again be prompted to sync your library to the cloud. 7) Sign in using your Silhouette America password email and password - that's the same one you use for the Silhouette Online Store. 8) The designs you've purchased and downloaded from the store will load into your library. 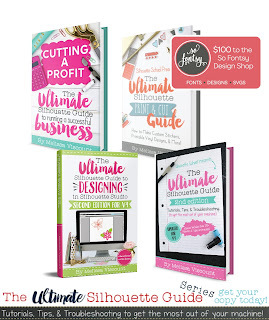 DO NOT WORRY WHEN YOU DON'T SEE ALL THE DESIGN YOU'VE CREATED or purchased elsewhere. 9) Now you need to re-import your library, which is why you exported it before you started. Click File > Library > Import Library (Careful NOT to select IMPORT TO LIBRARY). Navigate to the .exe file you save on your computer and the import will begin. If you have a large library this may take a bit of time. 10) Once this is complete all of your designs will be in your library. Your library now has two main sections: Local User Designs and Cloud Designs. BOTH SECTIONS ARE ACCESSIBLE WHILE OFF-LINE AND WITHOUT A WIFI CONNECTION! The only thing that is different is that if you want to move something from the Local User Design section to the Cloud, it won't update/sync until you have a Wifi connection. I cannot stress enough - you do not need Wifi to access your library, the cloud, or Silhouette Studio once it's synced. 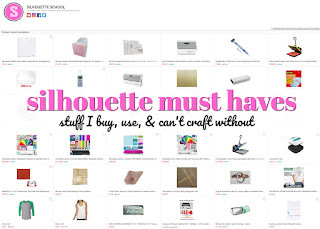 Silhouette is NOT going the way of Cricut where you need to have Internet access. 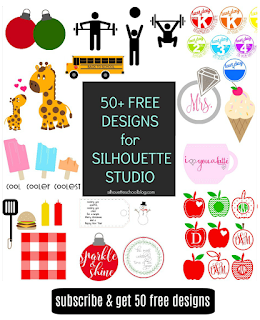 Also, the Silhouette Cloud is free and unlimited for all designs purchased from the Online Store. It's also free for up to 1GB of Local User designs. Also, you do not HAVE to upgrade to the newest version of Silhouette Studio at this time. And even if you decide to upgrade you do NOT need to take advantage of the Cloud. This is not something Silhouette America is forcing users into, it's simply a way to give users more options - namely the ability to easily share your designs between up to 5 devices so you can access them on multiple computers and on whatever devices you have the Silhouette Studio mobile app installed. I'll be sharing more information in the coming days - but I did want to get this out to you asap since I know the Silhouette Cloud upgrade is making people very nervous! I haven't upgraded yet, but when I do, I know how to do it correctly. Something that I have not been able to find the answer to is if you have the Silhouette Cloud can you delete the designs from your computer and just use Silhouette store designs from the cloud? My computer is full of the designs and I need to free up space. Thank you so much for all your help with Silhouette. I have learned so much from you!! Nicole, I feel with you. That happened to me last time with another update. I agree, they should tell people in bold letters to do a backup - and how - when you get the new version. DO we do this on all our machines carrying Silhouette Design? Or will it automatically sync by just upgrading the version on the other computers without doing an export and import step? Do we still have the folder structure we had created and organized our files into? Thanks for the very complete article! I followed all the directions and now my Mac keeps crashing while trying to import the library. Any suggestions? Thank you for this tutorial. I just upgraded and everything went very slick. Except . . . the files that are in my local user library are not in the cloud library. I didn't lose any files between the two, just have them in either/or and not both. Will Business Edition automatically upgrade to Cloud? If I understand all this correctly, I don't need the Cloud service if I don't use any other devices with my Silhouette, correct? All I ever use is a desktop computer. Are there any other changes/fixes/etc in this version that would make me want or need to install this software update? 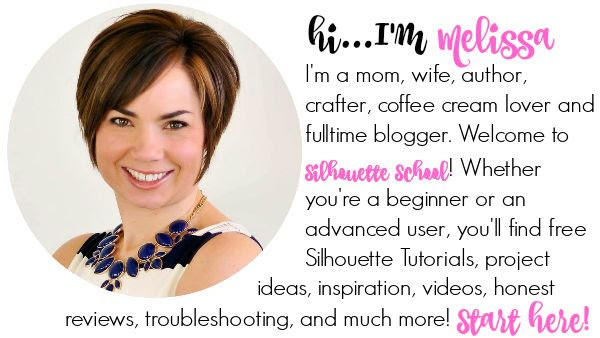 Thanks for being such a great resource for all us Silhouette users! you can upgrade - and skip the cloud part when asked. Though I am not sure whether there is anything like security which you need. Thanks for the tutorial. I didn't need to reinstall my library, it was already there for me. I'm glad to have the back up all the same. Unfortunately, I think I've found a glitch. Today I purchased several new fonts and designs with the current store sale. However, after upgrading to 3.7.206, the new fonts and designs are showing on my computer but not on my Silhouette Studio Mobile app on my iPad. I installed the new software on our family computer and everything but my own (hand made) designs show there. (as it should) I've been attempting the "sync" the iPad app but still no improvement. If you have suggestions, I would love to hear them. I will answer my own comment in case anyone else has this issue. I finally discovered how to make the new designs show on my mobile device. I had to go into Settings: Options: De-register Device. That brought me to a screen that allowed me to log back in. After doing so.. all my new designs were available. I did the update and now by any reason i can't print at any of my printers. So I did the update, my designs are there, but not my folder structure. All designs were just stuffed into "recent download" folder. I'm not too thrilled about that! I keep getting an error when trying to import my library after updating. Have you heard of this issue occurring and is there a fix? I keep getting the same error as tmbethea. Any solution yet to the error when trying to import my library after updating? Has anyone with a large library managed this? I've been trying for DAYS.... days and days here people. I have no problem backing up my library, moving it around, installing, uninstalling reinstalling... all old news. That said I've been using the last version of V2 on my macbookpro since I hated that I couldn't drag & drop into my SSDE icon to open files from the web in V3. Regardless I decided to give it a shot. Countless hours, testing on 3 different systems even, and I can not get either of the available versions of cloud V3 to show my large library (20,396 files, approx. 5.18MB). I have the most problems with the newest, the 2nd to newest I can actually import a library from V6 but it only imports approx. 12,000-17,000 of my files before it crashes and I lose everything again. Silhouette support only gives me directions on how to redownload my purchased files, those equate to less then 7,000 of my 20,000+ files... I want all my OTHER files to show up. If anyone has any ideas, please let me know.... at this point I'm so annoyed I went back to V2. How do you combine the 2 libraries? All does show all my designs; however the categories I have either has the files in the iCloud library or my library but neither have both. Thank you! Best bet is to revert back to an earlier version, then your library should be back and fine. Hopefully since SO MANY of us are having these issues they will actually fix it... we can hope. I got the error also when I tried to import my library. I have a Macbook Pro. I still had the earlier version so I trashed the new version. Must be some bugs in software. Will wait awhile to try again. Just don't delete your old version and you will be fine. I also am getting the error and its making me crazy!! I have a large library and most have transfered over but I am still missing a good number and all of my own designs are missing. I really wanted this to work AND I am suppose to teach a class on the mobile app and the cloud in two weeks... Ugh! I did the update. Once completed, I purchased some images from the store, and it shows the items purchased, but in the library it shows "item failed to download, try again". I clicked to try again and it still fails to download. Has anyone had this issue? 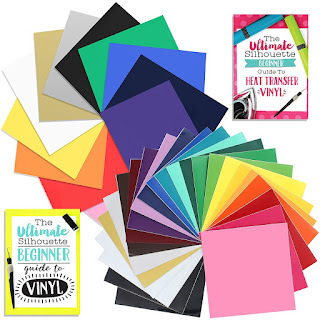 I've tried the new version for 2 months now and have had more issues, especially with print and cut, which is what I do most for my business, after so much frustration decided I am going back to my last version before I upgraded to the current version, the version before the cloud. I am so frustrated beyond words it has taken me 5 days straight of trying to print out my simple logo tag and wasted very expensive vellum. This version is NOT worth the what lost in printing and paper cost! UPDATE AFTER DOWNGRADE TO V.3.3.057. As mentioned above I decided to downgrade back to the previous version before the cloud, backing up library etc. as Melissa suggests. 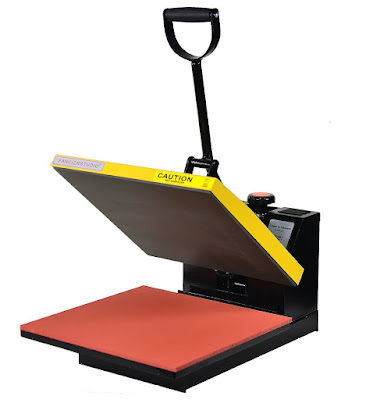 And sure enough, my print and cut issues disappeared immediately, but another benefit was for the life of me I researched and research, scoured SL software etc. on how to release the cursor after hitting control and arrow key without having to click off the duplicate, a shortcut to duplicate an image. In the V.3.3.057 it automatically releases from the original so you can move your duplicate without having to click off of it. This is key to moving all the small parts of an image after duplication. I am a happy camper now. So will not upgrade un Sil corp. tech team fix bug issues. Do you know why my 2 libraries don't match up? Say I have a folder labeled hearts...one library has some hearts and the other library has different hearts. All designs were purchased from the design store...shouldn't both libraries have the same designs in them if I purchased from the design store?? I have that same question - I hope someone has the answer! Me too. But I think I got the answer in the "Let's talk about the Cloud" video that was posted today. Check it out and see if it answers your question. @Jeanie Where is that video? I did a google search and did not come up with anything. I have a large library as well. It goes through importing just fine, but when it is syncing with the cloud it errors out. This is completely frustrating, and I think I have to have the newer version because I just received my Cameo 3. Any chance there's a way to do this on a Mac? I also updated before saving my files. I did it on a mac, same thing. 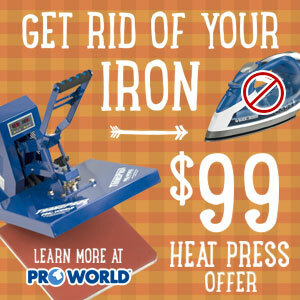 Instead the right key press ctr key. I had lots of problems, the same as mentioned here. "Lost" some files. Will find out later. Had to redeem my silh.files. You have to get used to have 2 parts in the list: local and cloud. I would not have done the upgrade if Melissa had not written it is so easy. For me it was anoying. But now it is gone. maybe a tip for Mac users: keep your old version on another place or rename it, so that you can go back easily, I still have both on my mac can open it one after the other. but after quitting 3.6 and then opening 3.8 I was asked to update my library. (what I did not do) Not sure if this happens all the time. I just received my Cameo 3. When I update to the newer software will my library from my Cameo 2 designs be there? Although I backed up the files (all 5gb of them) when I try to import the library I get an error message saying that the files are the wrong type. I didn't want to upgrade really but had to as just ordered my Cameo 3. Do you have any troubleshooting advice? Thank you. my files were not backed up before I updated to the newer version and clicked the prompt to update library. What happens now? Are all my designs, even my personal creations in the cloud? I haven't tried seriously everything. My library is large, over 5GB and around 20,300 files. Approx 7,000 of those are from Silhouette and I can get those to show up in my library just fine and on the cloud. I can not however get any of my user created/added files to show. I've tried to update my library, it shows it updating all 20,000+ files but then it gets to 10.8% and crashes every single time. I've exported from 3.6 and tried to import that library, but that also crashes out every single time. Since the vast majority of my files are user added this is a bit of a problem. Looks like I'm once again going to be going back to V2. (running a brand new macbookpro) So frustrating! I am trying to download from the silhouette store and none of my items download. Not automatically and I can't find a button that says to download pending like it use to. There is an update library but nothing happens. Am I missing something?